Despite my general disdain for zombies, I had some hopes of enjoying this film. While shambling corpses do little to interest me, classic literature does and I found that zombies tend to be tolerable in a comedy setting. Look at Shaun of the Dead; I could give two craps about the classic zombie movies it’s riffing on, but the comedy kept me more than entertained. Pride and Prejudice is at its heart a comedy. Yes, Elizabeth Bennet deals with some very serious issues, but foibles of those around her are exaggerated to comic proportions. With a title like Pride and Prejudice and Zombies there is really no place to go but to comedy. This makes it a shame that this movie resists that call so much. It still has plenty of comic elements, and those elements tend to be its best. Matt Smith plays Mr. Collins as obsequious to the extreme. He almost feels as though he has come from a different, much better version of this movie to lighten things up. Mr. and Mrs. Bennet act much as they do in the book, the lack of change works for a pair of already comedic characters. Unfortunately, the real fault lies with Darcy, who is played as charmlessly serious. While it isn’t a bad interpretation of the character, it doesn’t feel right for this movie. 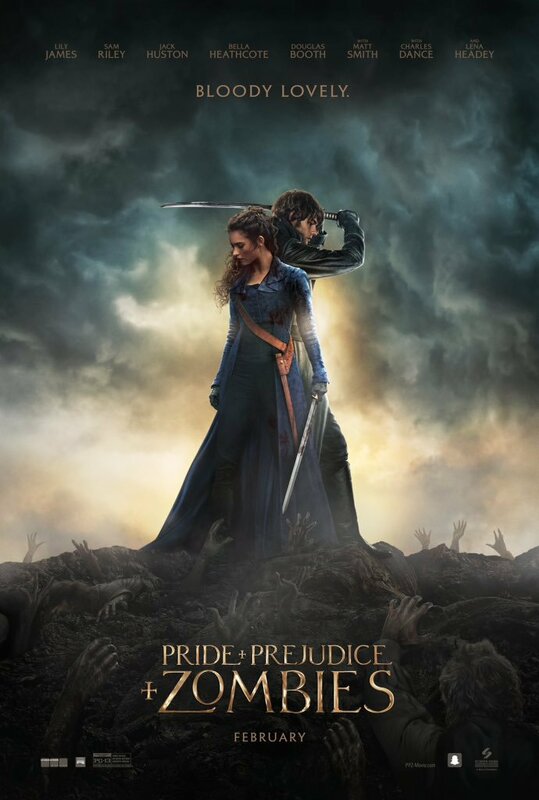 Lily James is better than this film deserves as Elizabeth, which works for her as the center of the film. Still Pride and Prejudice and Zombies is too serious for a movie as patently silly as it is. It does add some competent fight scenes to the mix, but it doles them out at odd times. Some changes to the book are inevitable in any adaptation, but this movie stick to the book oddly closely at times while going completely off the rails at others. The best one is at the ball at the beginning, with all five Bennet sisters showing their competence at zombie killing. The movie seems as though it is setting up some sort of point about the differences in where the upper crust learned their fighting styles, either in Japan or China, but that is dropped about the midway point. Many of the other fights are either too short or shot in too close to have much of an effect. Still, the battle between Mr. Darcy and Elizabeth during his first proposal is excellent, allowing them to show their emotions with more than just dialogue. The great shame is that the film builds to a big climax and them barely lets either character do anything during it. All the pieces are there, much time was spent showing how competent of fighters they are, but the last big fight is not so big and not much of a fight. Other than that, the film is just littered with ideas that dropped almost as soon as they are mentioned. There is something about the 4 Horsemen of the Apocalypse to lead the zombies against the humans, but not much comes of it. There is the whole Chinese or Japanese training segment. Lady Catherine de Bourgh looks fearsome in a couple of scenes, but she doesn’t even fight in the one scene it is all but necessary that she do so. Some zombies are able to avoid eating humans by never having consumed human brains, but no one other than Elizabeth seems to care. The whole thing seems half-baked and just reeks of squandered opportunity. I didn’t hate the movie, though. There was just enough there to enjoy that made it sting all the more how fleeting those enjoyable moments are. This could have been an excellent, schlocky mash-up, but instead it is a tepid mixture of ill-fitting parts. Maybe they did need to go for the extra gore and the “R” rating; that may have helped. The real problem is that it had too many ideas and wasn’t smart enough to sift the good ones from the bad. Interesting, nice review! Like you, I’m not a fan of zombies but love Shaun of the Dead, etc. I also like classic literature and am a Jane Austen fan. Sounds like I’ll be going into the movie a lot like you did then! It’s interesting to hear how comedic it is (and isn’t), as I wasn’t sure how it would play out going into it. I guess to me, the trailer made it look more like an action film that was just ignoring how ridiculous it all is and going for it, for fun. Which seems appealing.